This Picture has seem to cause a lot of issues among people who own or do not own pets. The fact that this says Yes Vs No, does not mean to leave rude, hateful, or even spiteful comments on any page that is posting this Picture. A simple Yes Or No will do. Yes people have a difference in opinion, there will always be difference in Opinion, but to keep throwing out comments like the ones I have seen on my page, the Pet Food Stamp Page among others, is just wrong. There are people out there who fell on hard times and need programs like this to help them until something better comes their way to help with what is going on in their household. Comments like: If you can't afford to get food for your fur kids, then you shouldn't have them. Or So you're saying I should pay for your pets? Or stop relying on others, Or Get off your asses and get a job, Should never be stated. You do not live in other peoples homes, you do not know what they are dealing with, you do not know their history, nor do you know them. People who have hit rock bottom are those who have been laid off from their jobs, Landed up in the hospital with a huge medical bill and no insurance to help pay for medicines, or they got into a major accident, and have been forced to quit their job, or there house repairs have diminished their food budget, Or Fosters who are working over time to help out local rescues who have been overwhelmed with animals, Or people who have a loan debt and the government took their Income tax check to pay some of that loan off, And that income tax check was to catch them up in bills, now their behind, Do we see the point yet? It is not right to judge those who say YES to this program. Saying Yes means they care about these animals and are willing to accept the help where and when it is offered to keep their Family members from going into a HIGH KILL shelter, when the No-Kill Shelters turn them away, because they can't take on anymore animals. 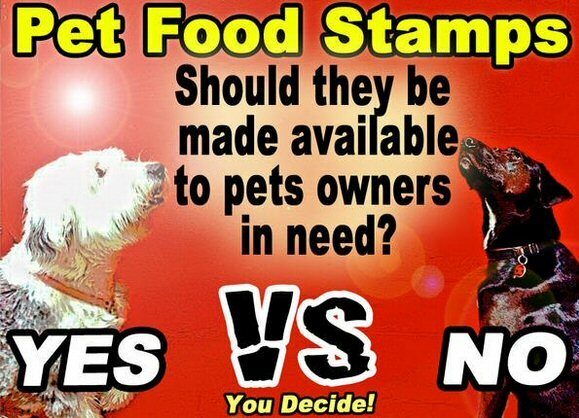 This Pet Food Stamp program, is the best thing that could of ever happened for some people who have fell on these hard times. I will never understand why people have issues paying into programs like this. The funny thing is, your taxes go into paying shelters to put animals to death. So instead of being pissed off at this program. How about rallying up to stop shelters from putting animals to death and wasting money, that could be going toward, keeping animals in house and home, and or pay for animals medical bills and so on. I'm speaking for my fur kids and the people who are having hard times who need this program. If you don't like what is going on fine, but don't judge or make harsh comments that aren't needed. People have enough problems then worrying about the possibility that they might lose their Best Friend/ Companion/ Family member. You aren't in these peoples shoes so you do not know how they are feeling or how much they are hurting physically, emotionally, financially. It Takes A Village To Raise A Child, Well sometimes it takes a Village/Community of People to RAISE or SUSTAIN an Animals well being and Future. If you truly care for any animals than why Oppose this program? Many people have had their fur kids for 2 to 10 years, it will be extremely painful to let them go, and truthfully it is just like giving up our Two legged children, and no one wants that. So have some common sense and a heart. Stop the hatred, the misconception and the spiteful comments. We who have wished and signed a petition for this program have fought hard to get this enacted. And we those who have fought for it, Are very grateful that this has finally happened. I thank the people behind the Pet Food Stamp Program! My hat tips off to the men and women behind this program. You have my 100% support on this. Further more, I will not allow argumentativeness debate on Our Page anymore. If you are there to argue do not bother posting or liking or even following. I do not need those who look for argument on our page. Our page is there for SUPPORT, TRUTH, FACTS, EDUCATION, NEWS, ANTI-BSL and most of all WARNING people of SCAMS, ANIMAL ABUSERS and so on. Our Page is Not for politics or spiteful debate. People who post on our page with that certain Attitude will be banned, like so many others have been. Haters, Trolls, Spiteful people, Uneducated people who don't want facts, or Childish drama Starters... Need not post on Our Pages.